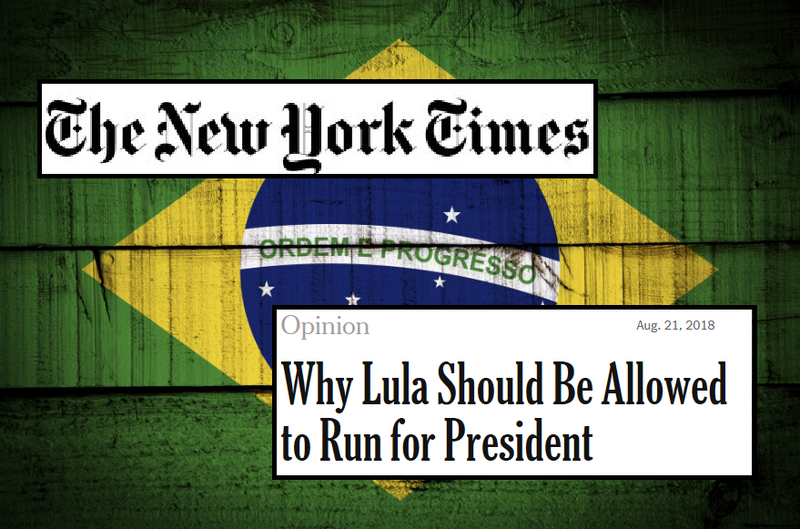 The New York Times editorial board pleaded openly for meddling into a foreign election yesterday as it urged the Brazilian judiciary to be overruled and allow former President Lula to run. The article was published at the same time that it appears the candidacy of Mr Jair Bolsonaro has taken the lead in polling. Mr Jorge G. Castañeda, the foreign minister of Mexico from 2000 to 2003, was presented by the NYT as a professor at New York University and a contributing opinion writer. He pleaded in his opinion piece to bypass the rule of law for the good of democracy. The sheer willingness of the largest newspaper in the world, who have been bashing the current White House administration for years on end for ‘alleged’ meddling by Russian operatives into the US presidential elections, to give a platform to a politician calling for an overturning of the rule of law in the largest Southern American nation is astonishing. The former Mexican minister of Foreign affairs began his career as a member of the Mexican Communist Party and wrote a biography of Che Guevara. It is, of course, possible that, just like many international observers have come to see in these past few days, the US media admits that the rightwing Mr Bolsonaro at this point stands a good chance of winning the 7 October election in Brazil and aim to influence (meddle) in a foreign election. We can only hope that this is not the case, because such would be illegal. Yes but when they do it, its not collusion ….